In this week’s Ask Chelsea Anything, we’re talking about something that is a taboo subject for many a self-identified feminist: the anxieties, guilt, and guilt about anxieties that can come with dating a broke man or having a low-or-no-earning male partner. Yes, we are imperfect creatures, yes, it is maybe a bit hypocritical, but it is human. These dynamics don’t exist in a vacuum, and even the most #unproblematic feminists may feel a sense of stigma when with a guy who simply isn’t bringing home any kind of bacon. So before I continue to spoil the question (and the answer! ), let’s get into the reader’s specific situation so we can discuss how to deal with us, and cleanse ourselves of our #problematic thoughts. 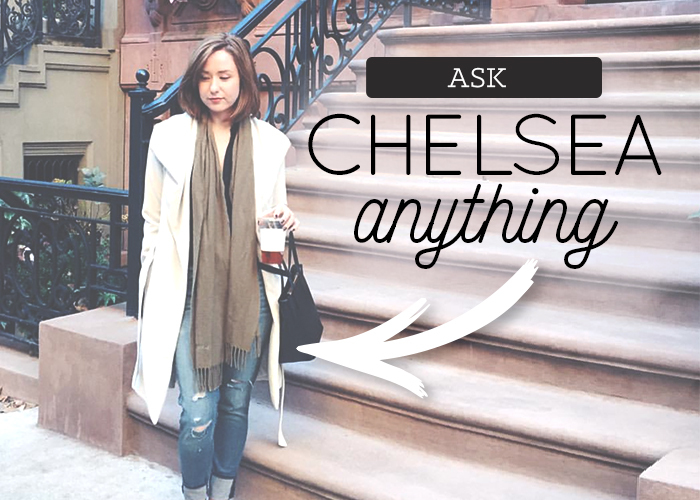 And as always, don’t forget to send your questions to askchelseaanything@thefinancialdiet.com. I find myself at a crossroads in my relationship today, where I am silly in love with the man I’ve been with since I was a sophomore in college (we’re both 27 now), but I don’t know if he makes sense for me as a partner. The truth is, he is an extremely low earner — he tutors music freelance and barely made $21,000 last year — and he doesn’t see himself ever earning much more than that. He loves his job, he loves music, he loves being his own boss and choosing his students and projects carefully, and he knows full well this means he’ll cap out at about $40,000 on the best year of earnings. This is all fine for him, because he prioritizes freedom and balance way over anything material, and is perfectly happy to live an extremely Spartan lifestyle and save religiously over the course of his life so he won’t have to earn more. He’s obsessed with those life hack-y websites about living on barely any money. And he grew up essentially on a hippie commune, so for him, this lifestyle has always been the norm and the expectation. And this of course intoxicated my college-self, and his indomitable spirit and joy for life are what keep me so in love with him. But I’m an adult now, and as someone who grew up in a financially-unstable household, it’s extremely important for me that I earn a comfortable and solid living, and that I do things like own property, travel frequently, and am able to save for my future children’s education. Right now I earn about $70,000 per year but I’ve started a side project that will hopefully grow my career and earnings into about twice what it is today. But this would mean that I would have to support my husband, more or less, and would have to cut out a lot of my financial plans. As an adult, I want a partner who is committed to the same things financially, and wants to be a high earner as well so that we could both share the responsibilites of our professional and personal lives. For example, I would like to change my schedule to part-time or work from home while my children are young, and that would not be an option with my boyfriend’s lifestyle. I know that with him I will have the sole, unerring pressure of being the breadwinner forever. And that’s terrifying. Part of this makes me feel un-feminist, but part of me knows that it’s just a fundamental incompatibility that I’m only reaching now that I’ve become a mature adult with more fleshed-out aspirations for my future. But I love him, madly. What do I do? Hey Annie. This is a super-tough question, and one I know I’m not equipped to answer alone, so I spoke to a friend who has been married for some time and is much more knowledgeable on the topic of dating a broke man — but more from her later. In the meantime, if I could say one thing up-front, it would be: forget about the feminist part. You are making a “feminist” choice if you are making a choice that respects you as an equal and worthy partner in the equation, whatever choice that may be. Feminism is not about living some perfect life dictated by a Gender Studies professor, according to outdated or reversed gender roles. It’s about holding women as equal, adult, independent actors and arbiters of their own lives, whatever those lives may be. Sometimes the choices that are right for you may not align perfectly with the “perfect” option according to The Feminist Playbook, but that’s not your responsibility. So the sooner you can stop beating yourself about that part of the question, the better. “I have seen a lot of divorces in the time I’ve been married, and I’m one of the few people I know who has never even had a brush with divorce. And I can almost certainly say it’s because we were aligned, first and foremost, as partners in life, before even as lovers. We agreed on all of the fundamental questions and goals of life, and asked ourselves the painful questions of where we stood on absolutely everything. We talked money heavily when that was not a thing people did, we went through every possible What If that was unpleasant to think about it, and we had a contract in place for our assets (at a time when that was basically never done unless you were a millionaire). Obviously, I’m not married myself, but I have seen similar stories play out around me, and have become the most pragmatic person possible for these reasons. I want my eyes to be Clockwork Orange-level open when I go into this kind of commitment, and that’s knowing I’m with someone I align with as much as practically possible on all the Big Life Questions. If I had a misalignment this huge with my boyfriend, and I saw it this early on, I can assure you that would be a dealbreaker for me. And it’s tragic, and it’s not a conversation anyone wants to have (particularly in our culture of Love Conquers All). But it’s particularly that culture that teaches us that any “non-romantic” reason for calling something off is just because we aren’t romantic or believing enough that leads us into these messes. Happily ever afters are constructed out of mutually compatible, pragmatic, adult decisions. And that means accepting that love is not enough for a lot of very good reasons, and that it doesn’t mean any less of us (the least of which that we’re somehow unfeminist for accepting these truths). Ultimately, only you can decide what is the right way to handle this kind of thing in your own life, but if the question you are looking to be answered is “Should I break up with this guy?” — and I suspect it is — the answer is “Realistically, yes.” And I think you know that, too, or you wouldn’t be writing in. I wish you the best of luck, and I’m sorry that you’re in such a terrible situation to begin with, but good on you for being honest. That’s more than so many people are willing to do, until it’s way too late.